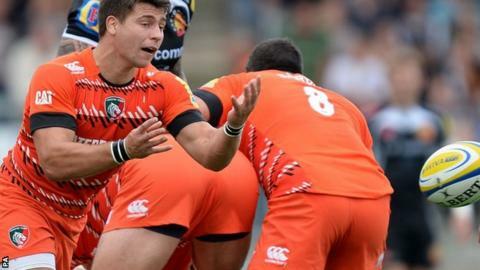 Scrum-half Ben Youngs says leading Leicester Tigers as captain is an effortless job in a side full of influential players. The 25-year-old inherited the role as skipper following Ed Slater's knee surgery, and has led Tigers to victory in their opening two Premiership games. "The job is pretty easy because of the experience I've got around me," Youngs told BBC Radio Leicester. "So many guys make great decisions, helping lead the team in so many ways." The England international, who made two Test appearances for the British & Irish Lions in Australia last year, continued: "I'm really fortunate to have such good leaders around me with Geoff Parling, my brother Tom, Manu Tuilagi and Anthony Allen. "Guys like that naturally lead anyway." Youngs helped Leicester clinch Saturday's 24-20 win at Exeter with a decisive second-half try, but he reserved praise for half-back partner Freddie Burns. England fly-half Burns has kicked 27 points in his first two competitive matches since joining from Gloucester and was instrumental as Leicester fought back to beat the Chiefs. "I'm really comfortable with him outside me and he is pulling the string and playing really well," said Youngs. "I certainly feel that we are making huge steps."